This is a comfortable, compact shielding suit, which mixes together the rubber with liquid crystals which helps in obstructing harmful chemicals while letting sweat to go through, for people working in chemical industries or mines as well as emergency workers. The liquid-crystal molecule, together with rubber generates petite particles that easily pass even through the small openings and impedes chemicals more efficiently than ordinary butyl rubber. This new technology help producing protective suits which are also functional for cleaning unhygienic water and taking out the salinity of seawater as well. There are also rubber suits laced with microscopic channels which could be used to make more comfortable, less bulky protective gear for people who work around hazardous environment. Military personnel, chemical workers, and others could benefit from this new synthetic rubber material tailored with liquid crystals. The rubber material is used to make body suits to protect chemical-industry employees from skin exposure to toxic vapors and aerosols, and at the same time providing protection for military personnel and civilians in the event of a chemical-weapons attack. The new composite is lightweight and breathable, but at the same time blocks the passage of toxic chemicals, reducing the risk of heat exhaustion in anyone wearing it. While the rubber suits with liquid crystals are used in high profile industries, all other industries use vulcanized rubber suits. 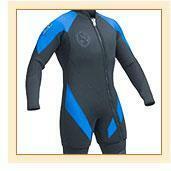 These suits are full length, long sleeves head to foot covered suits, available in various sizes and colors.